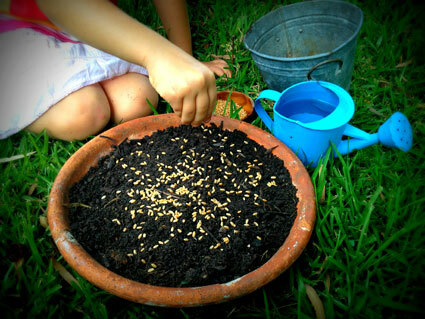 A tradition for us, as Easter approaches, is to plant our Easter grass. The story we share is that Easter Hare has woken and soon will be on his way to hide the coloured eggs the Autumn faeries have decorated so beautifully. All around the world he hobbles, oh, how very tired and hungry he must be, how lovely for him to have somewhere to rest and nibble a little. 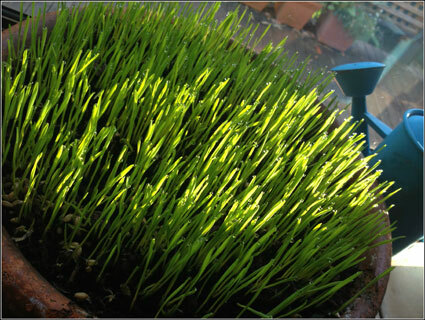 Wheatgrass seeds (the ones I use in my Faerie Garden Kits) are perfect. With careful watering they sprout within days and seem to almost grow before your eyes. Each morning my children exclaim “Look at the Easter grass!” as they enter the kitchen for breakfast and then again in the afternoon as they come home from school, “Look at the Easter grass!” Has it really grown while they’ve been away? I just love the tiny jewels of dew that sparkle on the tips of the grass each morning, a gentle reminder of Mother Nature’s beauty. Soon we will move the Easter grass to our table centrepiece where perhaps Easter Hare will rest, have a nibble and leave some coloured eggs. This entry was posted in Easter and tagged Easter, garden, tradition on March 26, 2013 by Ange.